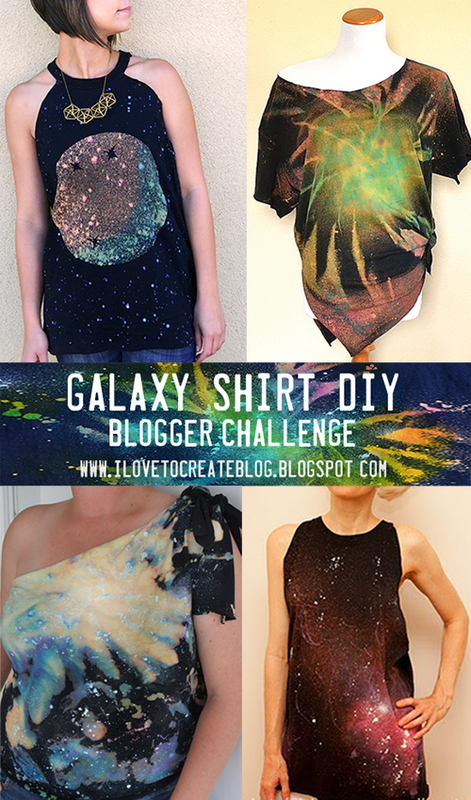 This week, four of our iLoveToCreate bloggers created awesome t-shirts inspired by the galaxy art trend. Each of the designers were sent the same shirt & Tulip Fashion Art products to get their celestial looks! 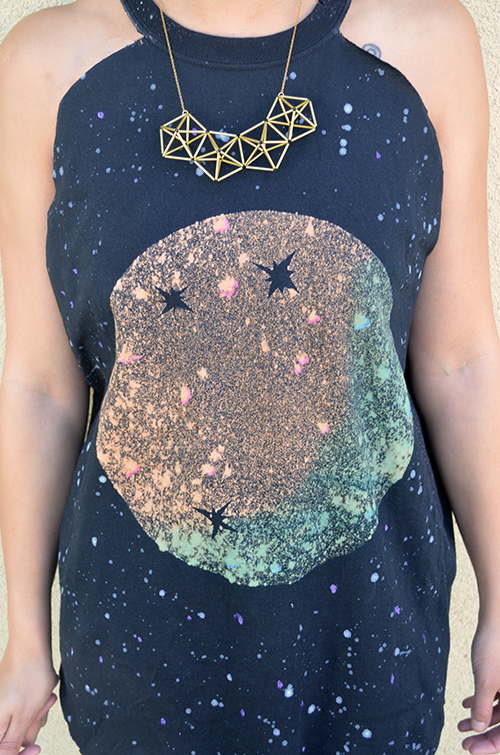 Even though it's cheesy to say this, these shirts are kinda out-of-this-world, don't you think? Check out what they used to make these shirts after the jump! 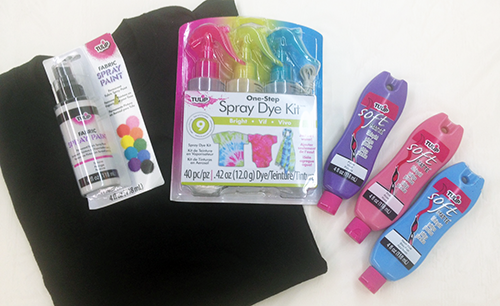 Each designer was sent the a Tulip One-Step Tie Dye spray kit, 3 colors of Tulip Soft Paints, a bottle of snow white Tulip Fabric Spray , and a large black Gildan shirt to make their own galaxy shirt. In addition to these supplies, they were asked to use bleach and their own basic tools (scissors, tape, etc) to make their galaxy masterpiece. 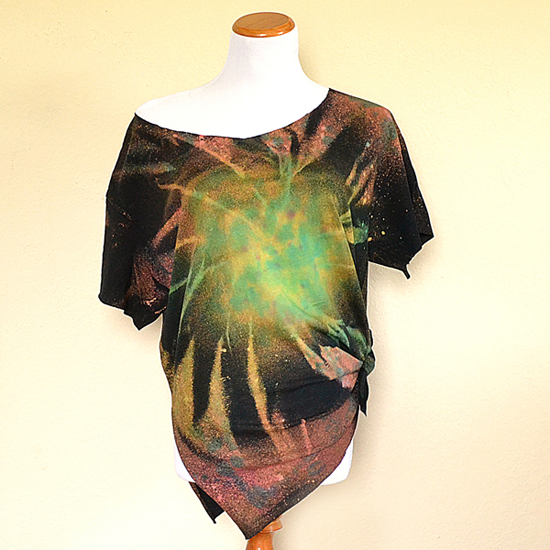 For Day 1, Allison did an asymmetrical and off-the-shoulder galaxy tee. This was a first for her, since this was not only her first galaxy tee, but it was also her first t-shirt hack! We love her twisted swirl and the way she hacked her shirt on the sides! 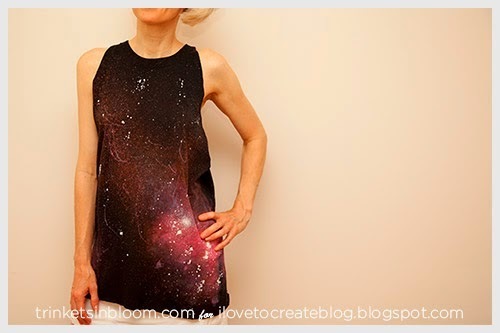 Jaderbomb did an off-one-shoulder knot & tied galaxy shirt that's super cool for a summer night! We love the coloration and patterns of her shirt...it's so cool and abstract. Brandi went to infinity and beyond with her galaxy moon shirt! She even gave interesting shading details using the spray dye! The halter style cut also added a super modern flair to her design! It'd be perfect to wear to a summer concert! 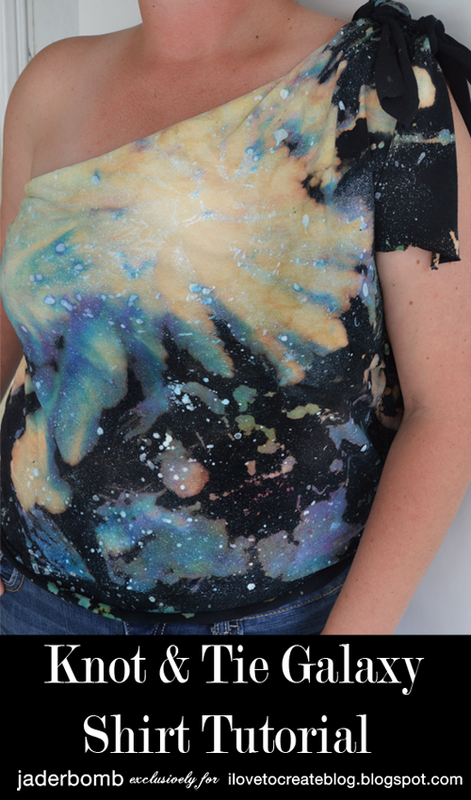 And lastly, Cathy of Trinkets in Bloom created a celestial coverup from her oversized tee that looks exactly like nebula space photos! Such a fun look to wear to the pool! Which look is your favorite? Leave a comment below and let us know which one you think is "far out"! Definitely the knot and tie shirt! I'm gonna write about this challenge at this blog. Join to the discussions!